In case you had forgotten about Rod Blagojevich, he's still on trial, and still proclaiming his innocence. Yelling it, actually. 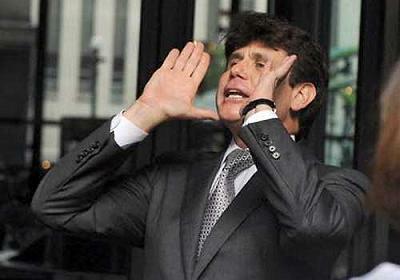 The latest summary from the Chicago Sun-Times says that the prosecution will probably rest this week, which means that f***ing golden moment when Blago takes the stand is getting closer all the time. As the report points out, much of the case against him is based on allegations of attempted crimes, such as bribery, extortion, and so forth, raising the question whether Blagojevich could be convicted if none of these acts were completed. For example, he is accused of trying to extort the Tribune Co. and Rahm Emanuel, but his aides testified that they ignored him. He is also accused of seeking bribes in exchange for a Senate appointment, and of holding up legislation in hopes of extorting campaign contributions, but he never got any of that money. So, just to be clear, we're talking about a guy who was such a screwup as governor that he couldn't even get himself bribed. If I understand the indictment correctly, Blagojevich has been charged with violating RICO based on a couple of dozen alleged predicate acts, many of which involve attempted offenses. (The indictment refers to the "enterprise" element of the RICO charge as "The [Rod] Blagojevich Enterprise," which sounds like the name of a really bad band.) So it shouldn't matter whether the crimes were completed; Blagojevich could be guilty of conspiracy if he or others actually took steps to commit the crimes rather than just talking. He sure did lots of that, and one law professor was quoted as saying that the defense theory is pretty clear: "I got a big, profane mouth," said DePaul professor Len Cavise, speaking as if he were Blagojevich, not referring to his own mouth. "I'm a loose cannon. I think the government's case lends itself to that defense." That might also explain the flurry of talk-show appearances Blagojevich was making a while back — more opportunities to be publicly loud and stupid. Speaking of which, at least according to Sam Adam Jr., one of Blagojevich's defense attorneys, Blago will in fact testify in his own defense. "We're looking forward for [sic] him to get up there and say what he's been saying all along," he said. So are the rest of us.